The Sony Cyber-shot DSC-T90 is a slim and stylish ultra-compact digital camera featuring a metal body, sliding front plate and folded optics. Measuring 13.9mm thick, highlights of the T90 include a 12.1 megapixel sensor, 35-140mm equivalent 4x zoom lens, large 3.0-inch touch-sensitive rear screen, Super SteadyShot optical image stabilisation, face and smile detection technology, ISO 3200 and intelligent scene recognition. The Sony T90 also boasts 1280x720 pixel 720p HD movie recording with stereo sound and HDMI output. 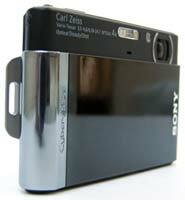 Available in silver, black, pink, blue and brown, the Sony DSC-T90 currently retails for about $300 / £289. The glossy T90 is the latest in a line of fashion conscious Sony Cyber-shot touch screen compacts - coming after the T77 and T500, rated on Photography Blog earlier this year. Like both earlier models it features a sliding faceplate that covers and protects the lens when not in use, and also acts as another means of activating the camera when it is slid open. Unlike the currently available T500 however, the T90 boasts an integrated 4x optical zoom (rather than 5x) and a 12.1 megapixel effective photo resolution (rather than 10.1). It's still minimalist and slender however, being a mere 13.9mm at its narrowest point, with the main talking point its 3-inch, widescreen ratio 230k-dot resolution screen at the rear. Another new model, the T900, boasts a larger 3.5-inch variety and basically looks to be the T500 with a resolution hike. As you'd expect, with a screen of that size on a compact, the T90 has no optical viewfinder to fall back on. Only a couple of Canon's compacts seem to be bothering to include them these days - a throwback perhaps to its traditional photographic heritage - and Sony of course has no such ties to convention. 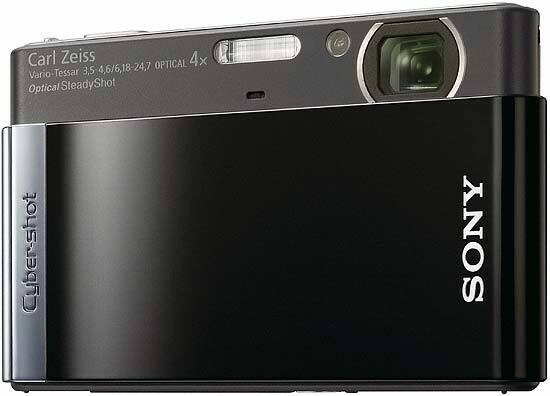 In fact the only physical controls the Sony Cyber-shot DSC-T90 possesses are a playback button shaped like a lozenge and situated top right of the LCD, plus a top-mounted on/off switch recessed into a mirrored strip. Alongside this is a second lozenge button for the shutter release and a teeny rocker switch for gliding through the 35-140mm equivalent focal range provided by the zoom. Boasting a Sony list price of £289 in the UK at the time of writing, gripped in the palm the mostly metal T90 feels rock-solid sturdy yet lightweight at just 151g with battery inserted. We had the sophisticated black finished T90 model in for review - although other less sober (blue, pink, brown/bronze) plus equally conventional colours (silver) are available. Providing the only actual means of gripping the camera are a narrow 'bezel' around the screen, with a couple of raised ridges and eyelet for attaching a wrist strap over to its right hand side. As well as inevitably festooning the screen itself with fingers and thumbprints (that only show up when it's switched off), the polished front plate also attracts smears. So you'll be wiping this camera clean almost as often as you'll be taking pictures with it. The lack of physical substance also suggests the Sony Cyber-shot DSC-T90 will be prone to camera shake. So Sony has fitted a dual image stabilisation mechanism in the shape of both optical SteadyShot and an ISO range that extends up to ISO3200. If not quite class leading, it's better than you'll find on an average point and shoot. As with its recent predecessors, present and correct on the T90 is the increasingly ubiquitous ability to shoot High Definition video clips, here in PC friendly MPEG-4 format with use of the optical zoom and the ability to fire off a snap in the middle of filming - though, like the T500, it boasts a maximum 1280x720 pixels video at 30fps as opposed to a full HD 1920x1080. Unlike the Canon IXUS 100 or 110 IS however, there's no direct HDMI output from the camera - nor an included docking station providing such a feature. Sony does however say that 60 minutes of footage can be stored on a 4GB Memory Stick (Duo or Pro variety). Interestingly, the manufacturer has added intelligent auto scene recognition to its line up of shooting modes, accessed via the left hand onscreen toolbar, working in identical fashion to the intelligent auto modes of Panasonic and Canon compact ranges. The user points the T90 at a scene or subject and the camera analyses it and automatically chooses one of 11 pre-optimised settings to best suit. Adding to its snapshot simplicity, this feature joins enhanced face recognition and smile shutter functionality on board - the former mode biasing human faces in the frame and the latter mode firing the shutter when it detects a smiling subject. With the camera looking fashionably understated when inactive, press the teeny, recessed power button on the top plate or slide open the faceplate to reveal the lens and, like its forebears, the Sony Cyber-shot DSC-T90 readies itself for action in a just over a second. The rear LCD bursts into life sound tracked by a musical flourish. The shutter release button has a definite halfway point, determining focus and exposure with a bleep of affirmation, focus points highlighted in green on the LCD. Go on to take the shot and maximum resolution JPEG images are committed to memory in a couple of seconds, the screen momentarily blanking out and then displaying the captured image before the user can go on to take a second shot. In revealing the lens, also exposed is the camera's built in microphone, plus a small and narrow window for flash, and a porthole for the self-timer/AF illuminator. As we've found in the past, with the lens situated to the far top right of the camera's front, when holding its steady with both hands, it's all too easy for the ends of fingertips to dip forward and therefore into shot. However, once thus 'bitten' you quickly learn to subsequently avoid it. Talking of fingertips, to the right of the shutter release button, if viewed from the back, is a small rocker switch for operating the zoom and alternating between wideangle and telephoto, the raised lip of which is only just large enough to connect with the pad of your digit. The action of the zoom itself is leisurely smooth rather than rapid, gliding unhindered through the focal range in a single, steady motion. With the T90's degree of design minimalism meaning that is it for the front and top of the camera, moving to the T90's back plate, we find a single playback button top left of the screen. Other than that single physical control, every other operation takes place in the virtual realm, the central portion of the screen displaying the image in 4:3 ratio on its default setting, while two menu bars with white text or icons on an all-black background frame it on either side - in effect cropping the screen's full 16:9 ratio. The view therefore is the same as that provided by the earlier T500 (albeit the screen itself is 3-inches, not 3.5). This similarity extends to the fact that top of the left hand bar, in regular stills capture mode, is a means of accessing Sony's 'Home' menu with a finger or stylus jab. Press this lightly and the user is instantly provided with an overview of the camera's main functions - shooting, playback, slideshow options, direct printing, 'memory tool' (with the ability to format the media in use, copy or create new recording folders) plus a composite set up menu. The latter includes the ability to deactivate the camera's 'bleep' that otherwise sounds at every button press. The screen on the Sony Cyber-shot DSC-T90 is responsive without being overly sensitive and, with use, we didn't find ourselves accidentally selecting the setting next to the one we intended as often as we initially thought we might. Bottom of the left hand bar is a second virtual button marked Menu. As we've remarked before, we don't know why Sony, unlike every other manufacturer, doesn't combine the functionality offered by Home and Menu. Though it cuts down on endless lists of options, having both is a little confusing. Via menu in program mode we get access to the likes of record mode (single or continuous shooing), three separate exposure bracketing options (three shots at 0.3EV, 0.7EV or 1.0EV apart, image size and ratio (4:3, 3:2 or 16:9), switching red eye reduction on/off, plus adjusting face detection sensitivity, or jumping straight to the set up menu that mirrors exactly what you can access via the Home button. Back to the left hand bar, and between the Home and Menu buttons we firstly find a self-explanatory face detection icon, a second for the self-timer, and a third providing access to the various recording mode choices. Here we get the optimized scene settings, along with intelligent auto, program, easy shooting mode (a much pared down display), plus access to shooting video. The movie mode has its very own low light and underwater shooting modes, while moving back to the left hand bar allows the selection of 1280x720 or lower VGA quality clips. All the while the bar to the right hand side of the screen (in standard 4:3 ratio capture modes) features icons for turning flash on or off plus a forced on and slow synchro setting and then, next down, macro on/off. Book-ending these two options are, at the top of the bar, a self-explanatory and useful 'back' button, and at the bottom a display button. Pressing 'Display' provides the choice of the default 'normal' display as described above, a 'simple' version or an image-only option, which as it sounds turns off all the toolbars and buttons (apart from display itself). In display mode users can also call up a live histogram or switch it off, plus adjust LCD brightness. This again is the same as found on the identically priced - and at the time of writing still available - T500. Staying with the rear screen menus and options, switch to playback mode via the dedicated physical button, and review options are again presented left and right of screen, running top to bottom. Looking first at the left, users have the ability to dip in and out of created folders of images, select slideshows and choose transitional effects and accompanying music, or delete duff shots - with the 'back' button again coming in handy if the user changes his/her mind. Also useful is the ability to be able to zoom in and scroll around an image to check focus and exposure. Press the shutter button halfway at any point and the user is helpfully catapulted back into capture mode. And that's basically it. With a press of the 'menu' button in playback, users have access to some funky in-camera retouching effects, including the ability to crop or sharpen portions of an image, blur the periphery to add emphasis to the central subject, add a starburst effect or bizarrely, force a smile on formerly sour-faced subjects. 'Painting' onto an image - or more likely scribbling all over it - adding a stamp or a frame is also encouraged. This being the case, touch screen operation is either love it or hate it. Luckily the buttons and icons on the Cyber-shot T90 are just large enough for finger operation (with an alternative plastic provided in the box that clips onto the wrist strap). That said the busy array of options around the screen - especially in Program mode - can be rather distracting. The bottom of this slender Sony features the merest of embellishments: a standard screw thread for attaching it to a tripod, alongside which is a narrow flap with lockable catch that protects the shared lithium ion battery and removable media (an optional Memory Stick Duo or Pro variety with a hardly worth it 11MB internal memory to fall back on). Sony claims the battery is good for up to 220 shots from a single charge, an improvement on the paltry 160 shots of the T500 but still no great shakes, so if you're looking at this as a possible travel companion you'll want to take its charger with you. But is the Sony Cyber-shot DSC-T90 worthy of making the trip with you -in other words does it perform well in the area that matters most - namely the capture of images?